Texas Rangers Cards: Big news, Big cards. So, I got a phone call from Mark the Royals fan last Friday night. He was pretty pumped and had some big news to share. He had tickets to the World Series. One for game one and two each for two, six, and seven. That is some big news. Mark scored the tickets for face value. That's big news as well. The story of getting the tickets was pretty neat but that's Mark's tale to tell. Needless to say, he was really looking forward to heading off to Kaufman and seeing the series. Can't blame him, I would be pretty excited as well. Hopefully he sees a Kansas City title. I'm pulling for the Royals this year and really want to see them come out on top. During the conversation Mark mentioned he just made a rather large trade with a Mets collector we've both been trying to reach to propose trades. Mark has quite an extensive Royals collection and had a bit of a hard time coming up with enough he needed to round out the trade. He hit my wantlists and filled out the trade with Rangers. He wanted me to know to be expecting a box. The box arrived Monday and it was big. 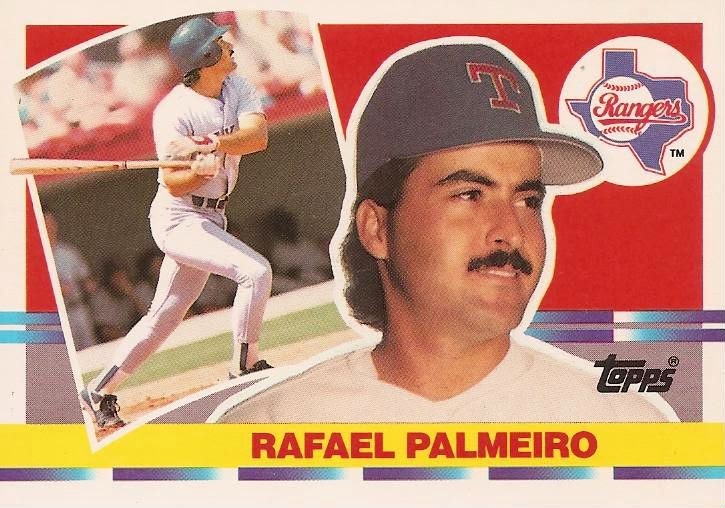 Well, it had this 1990 Topps Big card #127 featuring Rafael Palmeiro in it. That and about two hundred and fifty other Rangers cards. Mark was right, he hit my wantlists. The box shrank my wantlists by almost four pages and completed ten team sets. That's big. Bigger than anything I have to send in return. Me not having anything to send in return is probably the biggest thing about this. Mark mentioned the box on Friday night in order to tell me not to send him anything in return. Nothing, just enjoy the cards and cross them off the list. Now that's big. Thanks Mark.